My first job after college was as a book editor at Edizioni Press, a boutique publishing house in Manhattan that specialized in architectural monographs. I had no background in architecture, aside from a few art history electives, so there was a lot to learn. One early lesson was that there is more than one kind of architect. My boss put it to me this way: “In Europe,” he said, “architects are more like artists. Here, they’re more like businessmen.” He told me that just after we’d met Patrick Blanc, a French botanist who was making a name for himself designing vegetated walls. Blanc wasn’t an architect, but close enough. His hair was died green and his fingernails were long. When asked if he wanted something to drink, he requested a beer, even though it was before noon. He didn’t come off like the people I’d met from the big corporate architecture firms, who were difficult to distinguish from stockbrokers or lawyers. This architecture thing is interesting, I thought, lots of different types of people. Artist/businessman, to that point, is too reductive. As my familiarity with the profession increased, I came to understand that there are many more facets of architectural personhood: the riled-up, screaming from the rooftop, speaking truth to power, social justice architect, for example; or the butch, tectonically oriented, DIY builder-craftsperson architect; not to mention the tech-geek, parametrically enabled, CNC robot manipulating architect of the machinic domains. There are so many types, in fact, and hybrids of multiple types piled together in strange assemblies, one has to conclude that the role of an architect isn’t a simple one, or easy to define. A year ago in the pages of this magazine, Andy Tinucci, AIA, wrote that architects make images, yet we all know that there are some architects who rarely put pencil to paper, or finger to mouse, but instead ply their trade shepherding clients and, hopefully, steering them toward decisions that will prove beneficial to the built environment: the silver-tongued, dream weaving, natural-born wheeler dealer schmoozechitect. This peculiar and appealing heterogeneity of the profession was on my mind again while I was in New York City in June for the AIA national conference. Two experiences in particular brought the artist/businessperson dichotomy into focus: attending the 24x24x24 event at the Storefront for Art and Architecture, and observing the ongoing construction of the massive Hudson Yards development next door to the Javits Center. The 24-hour marathon event at Storefront, which took place on the summer solstice, invited 24 architects to create 24 stools that “provide an antidote to over polished, hyper refined, hyperbolic, and expensive design,” and to present these stools with an hour of programming. 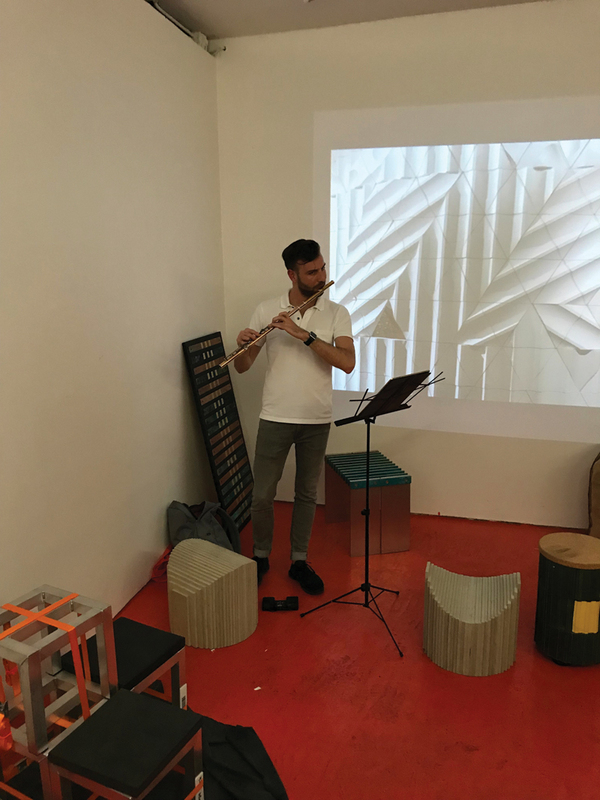 One standout was GRT Architects, who made a fluted ceramic stool that was presented with a slideshow of fluted architecture throughout history, sparkling wine served in champagne flutes, and a live flute performance by Andrew Rehrig. The aesthetic inquisitiveness of the visuals, the effervescence of the libations, and the lilting notes of the music (“Syrinx,” among other tunes by Claude Debussy) did much to restore a mind made dull by a day spent entertaining the patter of product reps and breathing carpet fumes in the convention’s expo hall. In a music/image/booze-induced reverie, I found myself standing beside another Texan — Charles Renfro of DS+R — who appeared to be as entranced by the piper et al. as was I. On the tail of the flautist’s final strain, I overheard Renfro compliment soon-to-depart Storefront director Eva Franch Gilabert on the event, comparing it favorably to the heady days of the 70s and 80s — I assume in that it was promiscuous in its variety. The previous presenter, after all, had shucked oysters on the sidewalk. Local #46 protests ufair wages and conditions at the Hudson Yards development. 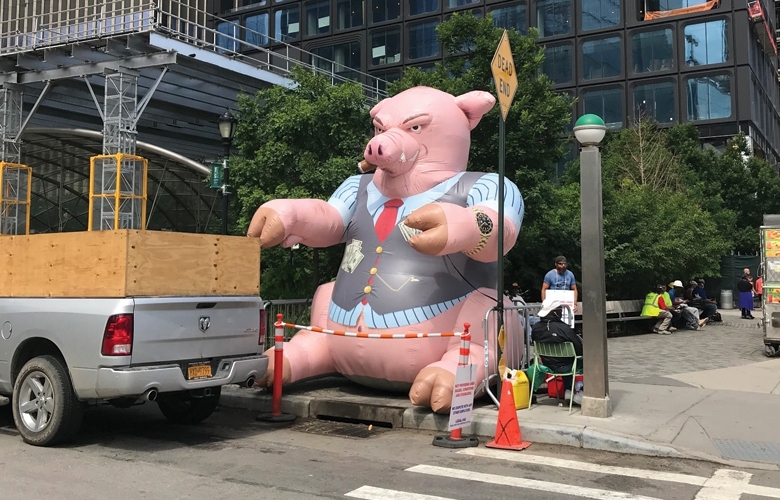 The next morning, I climbed out of the 34th Street/Hudson Yards subway station on my way to the Javits Center and came face to face with a giant, inflatable pig. It was dressed like a banker, with hundred-dollar bills fanning out of a pocket, a Rolex on its wrist, a cigar in its mouth, and a sinister look on its pink face. It was a protest by Local #46, the metallic lathers and reinforcing ironworkers union. They had a beef with some of the builders of Hudson Yards. A sign next to the pig read, “NOT PROVIDING AREA WAGES, CONDITIONS AND STANDARDS.” Nonetheless, the dust and noise of construction continued to crank away — lifts whirred up and down, mallets clanged, dumpsters boomed as they were filled with debris. Even by Chinese standards, Hudson Yards is a big mixed-use development. Its square footage is measured in the tens of millions, its cost in the tens of billions. A deal between the state, the city, and the transit authority, two developers (Related Companies and Oxford Properties), one master plan architect (KPF, perhaps the epitome of the artsy-corporate architecture firm), and a slew of other design practices churning out the project’s 16 skyscrapers packed with class-A office, retail, hospitality, and residential units, acres of public outdoor space, including the final phase of the High Line, one puzzling stairway-to-nowhere observation platform (“Vessel” by Heatherwick Studio), and even an ambiguously programmed performing arts facility, which has been prosaically named “Culture Shed” (by DS+R), it’s clear that this is one of those projects intended to make money, and a lot of it, even though some of its components are buildings that cost money. The first phase is well on its way to being finished and it’s possible to see in steel, aluminum, and glass what was already apparent in the renderings: something more than the spreadsheet is at work here. The towers — one leans this way, another that, one transitions from a rectangle to a cloverleaf, another evokes the city’s cast-iron past — seem to be vying for supremacy in a look-at-me contest. It’s a sort of Dubai in New York, where the real estate bean counters have bought the notion from some charismatic soothsayer that a thing as lame as extravagant and otherwise purposeless formal posturing will give them an edge in a competitive leasing market. They’re probably right. At Hudson Yards, art, or something resembling art, has infected the spreadsheet. But the wrong part of the bacterium was absorbed. The outward formal variation of great art is present, but it’s there as smokescreen. It does not refresh and delight the mind with unexpected combination and variation as did GRT’s presentation of flutes. It conceals the underlying banality and numbing repetition of its parametrically designed, pre-fabricated structural and cladding systems, not to mention its overriding purpose as a machine for fattening the wallets and indulging the appetites of the already rich and powerful. Architecture may not be at fault for the way of the world, or capable of changing it, but it does have the ability to turn the too-often venal and short-sighted motivations of its clients into something far more generous and diverting. That it fails to do so most of the time is infuriating and depressing because so much is at stake in each building project — time, money, resources, the future itself. Perhaps by further harnessing and developing architecture’s diversity, not to mention increasing its promiscuity and potential to surprise, better outcomes might ensue.